I'm focusing most of my January reading on cleaning out my e-reader for the #CleanYourReader challenge (not to mention catching up on February and March review copies already...), but since I can never resist the lure of the '20s, I'm also hoping to read a few books for Jazz Age January, a reading event hosted by Leah at Books Speak Volumes. Of these, The Great Gatsby, Paris Without End and Eve in Hollywood all reside on my Nook, so will lend themselves well to the Clean Your Reader challenge as well. And since I want to re-read The Great Gatsby before reading So We Read On, and read Paris Without End before reading The Paris Wife, both seemed like they could be the kick-in-the-pants I need to finally pick those up. 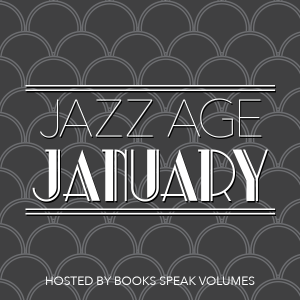 Are you participating in Jazz Age January? What are your favorite 1920s-era reads? Love the jazz age. A few good nonfiction ones are 'The Girls of Murder City' (the real story behind Chicago) and The Poisoner's Handbook. Killing two birds with one stone. I like it. I'm hoping to get to Brideshead Revisited sometime during January. Great challenge. It's something I think a lot of people could make use of. Right now my January is so packed i think i will feel lucky if i get any books read. Oh, I've never read it! Looking forward to your thoughts. I've heard of both of these but they had slipped off my radar. Thanks for the reminder! Oh, good to hear! I'm excited for that one.